For the crushed salt of the professionals, you need a salt mill of a quality you never thought possible. Ever. A quality you can’t possibly comprehend. Beyond good, beyond evil, beyond your wildest imagination. 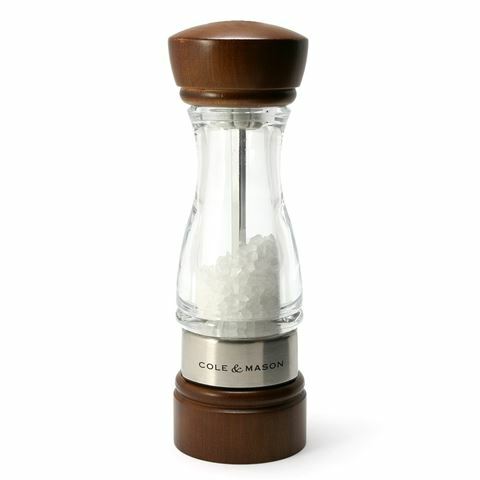 But Cole & Mason gave it a shot, with this quality grade gourmet salt mill. This mill comes with three pre-set grind levels, for different textures and qualities, from fine to course. The crushing blade has been manufactured from hard wearing, non-corrosive, aluminia ceramic for a superior grinding performance, with a spring loaded mechanism for a consistent grind. Simply slip in coarse sea or rock salt, select your setting from the easy twist base, and grind away! Professional grade salt grinding mechanism made from aluminia ceramic. Gorgeously designed for table presentation in mind. Please note: we recommend that when using a Cole and Mason Salt Mill use coarse sea salt crystals only.